Ya Ali Madad. The 59th anniversary of our beloved NOOR MowlÃ¢nÃ¢ ShÃ¢h Karim Al-Hussaini's (a.s.) accession to the masnat of Imamat will be celebrated on July 11, 2016. 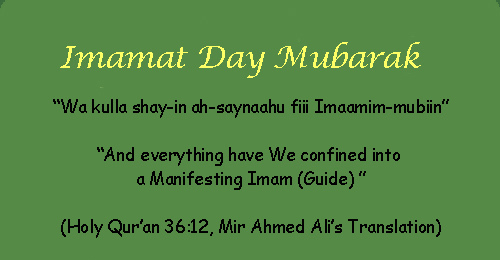 We would like to extend our heartfelt felicitations to global Jamat for this auspicious occasion. May Noor Mowlana Hazar Imam and the Noorani Family be blessed with peace, happiness, long life, excellent health and security. Ameen. Why should we pray for both the worlds? Is this world as important as the next world? What should we do to meet our Lord? What are the rewards for true friends of God? How quickly are our deeds recorded? Who is the greatest guide for our return journey? What are the fruits of performing bandagi (meditation)? Over the past 59 years, Noor Mowlana Hazar Imam has strengthened the Ismaili identity in context of the Islamic Ummah and has nurtured contact and communication between Jamats of different backgrounds and traditions across the world. Our beloved, present and living Imam is at the center of our Tariqah. As he is the bearer of the Light of Allah, it is his Noor which guides us in spiritual and material aspects of our lives. Al-hamdulillah, the Ismaili Muslims are blessed with the knowledge, wisdom and guidance of the Manifesting Imams since the time of Noor Mowlana Murtaza Ali (a.s.). 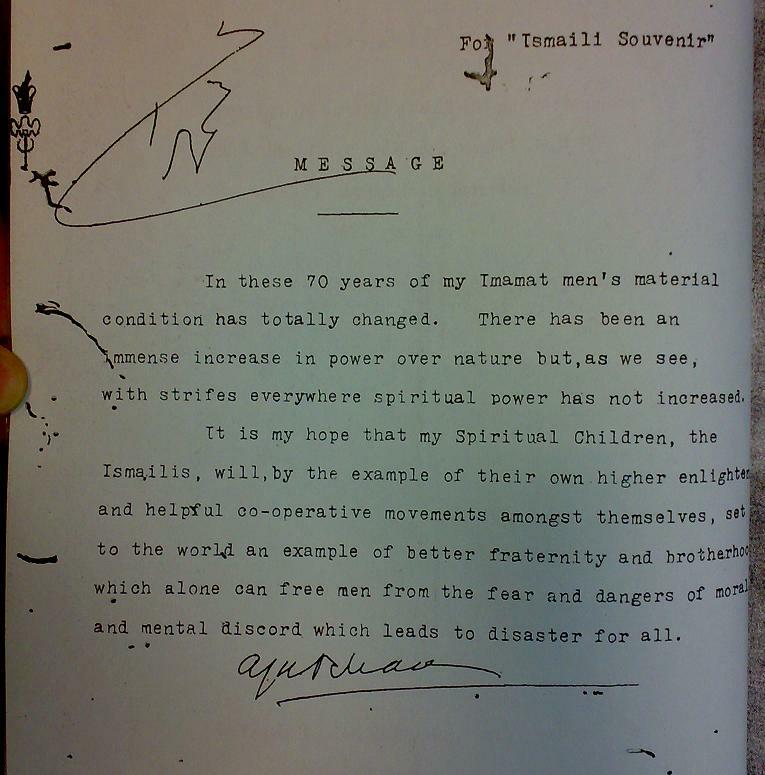 "In these 70 years of my Imamat, man's material condition has totally changed. There has been immense increase in power over nature but, as we see, with strifes everywhere spiritual power has not increased. It is my hope that my Spiritual Children, the Ismailis, will, by the example of their own higher enlightenment and helpful cooperative movements amongst themselves, set to the world an example of better fraternity and brotherhood which alone can free men from the fear and dangers of moral and mental discord which leads to disaster for all." In this Candle Post, I have used two great resources: (1) The Holy Qur-'aan: Transliteration in Roman script by M. A. Haleem Eliasii with original Arabic text and English translation by Mohammed Marmaduke Pickthall (Stockist: Iqbal Book Store, Karachi, Pakistan), and (2) The Holy Qur'an with English translation of the Arabic text and commentary of the version of the Holy Ahlul-Bait by S.V. Mir Ahmed Ali. The second edition of the book was published in 1995 by Tahrike Tarsile Qur'an, Inc., Elmhurst, NY. For each ayat presented, I have used Eliasii's transliteration and Mir Ahmed Ali's translation and commentary. I conducted research on how we should live in this hectic, consuming, demanding materialistic world and becoming enlightened at the same time. Thus, we are looking at the guidance from the Holy Qur'an and see how this is being implemented in our lives through the continuous guidance of our Holy Imams, and our present and living Imam, Noor Mowlana Shah Karim Al-Hussaini Hazar Imam (a.s.). Part 2: Why should we pray for both the worlds? 227 'Those who pray for the present life only or only for the hereafter show that they feel themselves secure in the life for which they do not pray for, without the help of God. Hence the prayer of a true or a sincere believer must be for both the life here and also for the life hereafter. Since 1973, Noor Mowlana Hazar Imam has emphasized the balance between Din and Duniya; the balance between body, soul and (higher) intellect (1994); and in the Golden Jubilee (2007), he raised the bar through the following prayer: "And I pray that you may live in peace with spiritual enlightenment to guide you." The well being of the global Jamat is being enhanced under the banner of 'Quality of Life' in terms of activities in spheres of health, education, financial stability, and community welfare and development, i.e., duniya. These activities are augmented through Din by our participation in the spiritual and luminous spheres through activities such as prayers, bandagi (meditation), charity, volunteer service, the use of sound ethics, and concern for all because we are all created from a Single Soul. Part 3: Is this world as important as the next world? 2515 'There is in this verse the manifest truth about this world. People not only spend their life in it, but they mostly indulge in showing off and boasting and piling up riches in rivalry—See 6:32, 29:64, 47:36. Note the divine mercy of the Lord constantly mentioning of His wrath and the punishment followed by His pleasure and pardon. "This world is the farm to cultivate for the hereafter." "This world is a prison for the believers and a garden for the disbelievers." Part 4: What should we do to meet our Lord? Faith has to be infused into the heart. This is the practical application of the sixth Divine Name of Allah, Al-Mumin, The Infuser of Faith. In his firman, Noor Mowlana Sultan Muhammad Shah (a.s.) has said 'Iman is a thing that one can get by pray for it (Iman); for that you have to go to Imam. There is not other way or short cut to it.' (Precious Pearls, No. 19, p. 16]. At its highest level, faith is or becomes light according to the following words of Noor Mowlana Sultan Muhammad Shah: 'Iman Noor chhe' (Source: Ruhani Raaz Gujrati firman book, p. 59). Thus, when faith infuses into the spiritual heart, it becomes light (Noor). Also, please reflect deeply on Noor Mowlana Hazar Imam's wish that '... (at) all times you should carry in your hearts light, faith, humility and happiness.' (Karachi, December 13, 1964). Note the tight connection between enlightenment, faith, humility and happiness! Al-Hamdulillah! Part 5: What are the rewards for true friends of God? 1027 'It is quite natural that those who have befriended themselves to the Lord will naturally get freed from every kind of fear or worry from any quarter whatsoever other than God. The first Holy Imam Ali-ibne-Abi-Taleb said that those to whom this verse applies (i.e., those meant by 'Aulia Allah') are the Holy Imams and the those who faithfully follow them. They will be mostly silent, remembering God silently. When they see, their insight would impart a lesson. Their speech will be full of wisdom. Their walking among the people would be a blessing of God. Their souls in their bodies would be restless with the fear of the Wrath of God against any cause for it or for the eagerness to get the return of their goodness and excellence in this life and the life hereafter. No fear would frighten them nor any sorrow would grieve them. They discharge all the prescribed duties and use only things made lawful by God. To abstain from all unlawful things and deeds. They abide also by the 'Sunnat' of the Holy Prophet, i.e., the goodness which he Holy Prophet did in his life in addition to the prescribed duties. They are by nature and habit, disinclined towards this material world. They acquire only lawful sustenance for them and use only clean and pure things. They never pride or boast of their worldly wealth. And of their well-earned wealth, they spend as God has willed it to be used and not as they will, i.e., they spend it in all godly ways. 1028 'Regarding the promise in the next verse, i.e., for those who believe and guard themselves against evil, the Holy Prophet said that the good news which the friends of God, i.e., the true believers are promised in this life are the good visions they would see in their sleep and the promise in the hereafter is that, when a believer gets into the agony of death before he breathes his last, the Holy Prophet and the Holy Imams appear to him and give him the glad tidings that whomsoever he loved in his life-time are ready to receive him and whatever he prayed for, is there already provided for him.' (p.726). Part 6: How quickly are our deeds recorded? Part 7: Who is the greatest guide for our return journey? 677 Waseelah', i.e., means of approach. To seek the pleasure of God by obeying His commands and abstaining from everything forbidden. Thus the 'Waseelah' or the means to reach God, is to faithfully follow the Holy Prophet and the Holy Imams who had always been on the right path for they are ones purified by God Himself (33:33) who are always guided by the revelation from God and the divinely inspired knowledge, who never in their lives yielded to falsehood—whose lives always been beacon lights of knowledge and the divine guidance for mankind. Part 8: What are the fruits of performing bandagi (meditation)? 'I remind you once again that you must understand that each one of you has a soul and this soul is eternal: and it is the duty and responsibility of each one of you to remember that you have a soul. For this reason, it is necessary for each individual to attend Jamatkhana regularly and to be regular in your Bandagi and your prayers. In everyday life you must not forget—whether you have worries, troubles, tribulations or whether you are successful in life, whatever circumstances you may be placed in—that the most important aspect of your worldly life is your religion, your faith, your soul. I ask you whether you will be regular in your attendance in Jamatkhana? I ask you another question: Which is your first responsibility in life? I pray to Noor Mowlana Hazar Imam to expand the spiritual hearts of all the members of the global Ismaili Jamat immensely and fill them with his Noor and nothing else! Ameen.